"I used to hate going to the dentist, but now I sleep through all my dental visits, even for hygiene… Dr. Lee is the best!" Total Sleep Dentistry is the right choice for patients with special needs, including: alzheimers, anxiety, autism, hypersensitive gag reflex, needle phobia, mental disorders, etc. 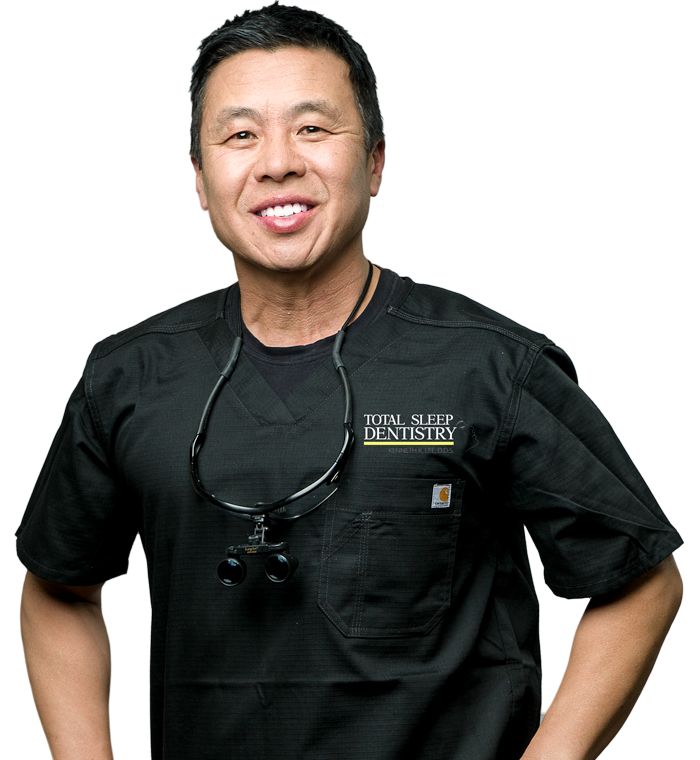 Dr. Kenneth Lee and the staff at Total Sleep Dentistry will provide you with the kind exceptional, quality, compassionate care. Their greatest desire is to remove any fear or anxiety that you may have in regards to past dental experiences so that you can enjoy painless, relaxing and comfortable dental care. A pain free experience is available through the use of various forms of sedation dentistry. The majority of the dentistry performed at Total Sleep Dentistry is with general anesthesia. However, oral sedation, inhalation sedation, or IV sedation are also available based on your specific needs and medical history. The special care you will experience here will calm your fears, relieve anxiety, and create a peaceful environment that you have never experienced at other dental practices. Would you like to leave the office with no fear about returning to the dentist again? You can! We provide a great experience not only through our analgesics and anesthetics, but also with a friendly staff and relaxing atmosphere. As soon as you walk through our doors, your comfort is our top priority. Your time with us will be calm, comfortable and pain-free from the beginning to the end. LANAP is a procedure in which a laser fiber about the width of about three human hairs is inserted between your tooth and the gum tissue where it removes the poison that causes gum disease.This is a cutting edge technique that allows for a much less invasive approach than previous surgical techniques. The dental implant is an artificial porcelain crown and titanium implant to serve as a tooth root, which replicates your natural tooth. When the implant procedure is performed correctly, an implant is just as strong and long lasting as your natural tooth. We provide implants as well as mini implants for dentures, with a comfortable procedure performed under general anesthesia. With our modern techniques and equipment, it is possible to restore the look and functionality of broken, decayed teeth. Dr. Lee has many years of experience in color-matching, shading and shaping teeth to create the smile that is just right for you. Not only can you have the smile you have always wanted…you can get it while you sleep ! At our licensed surgery center, we have strict safety protocols in place so that you can relax and know that you are in great hands for your dental care. Do your teeth cause you to keep your smile to yourself? Have you found that you cannot feel comfortable laughing and having fun with others, because of the shape of your mouth? If these experiences ring true with you, then come to see Dr. Kenneth K. Lee and his experienced staff at Total Sleep Dentistry. Allow them to show you how they can take care of all your dental issues in one day, without pain, or shots, or anxiety. When you come through our doors, you will find a staff that is caring, gentle and understanding, as they guide you through a painless restoration of your smile. No matter what you need: cosmetic dentistry to improve your facial contours and smile, removal and replacement of teeth that are beyond repair, or just cleaning your pearly whites to make them sparkle, Kenneth K. Lee Total Sleep Dentistry in Los Angeles is ‘one stop shopping’ for all your dental needs. You will experience better overall oral health and find that the smile you once hid will be the first thing you do when greeting new and old friends. All services are available with IV sedation or general anesthesia. Having the choice to select ‘one stop dental services’, gives every patient the chance to have exactly what they need, when they need it and in a sedated manner to manage fears or special circumstances. The ability to have all you dental issues addressed in one visit saves time and money. By eliminating the fear and anxiety that go along with visits to a dental office, you will never hesitate to take charge of correcting dental problems or improving your looks with the kind of smile that will impress everyone you meet. You will be able to direct and manage your dental health care in a pro-active manner, now that you can do so without pain or discomfort. Your smile will thank you. Your gums and teeth will thank you. Your overall health will thank you. We, at Total Sleep Dentistry, provide every person an individualized experience that caters to the special dental needs or desires that they may have. Bad dental experiences will become a thing of the past. Needles or uncomfortable objects in your mouth will never be part of your dental treatment. Please call 818-875-0442 to make your consultation appointment today.